Several theories and methodologies are proposed over the years to assess the ultimate bearing capacity of isolated or interfering shallow footings resting on horizontal or sloping grounds. Progressive urbanization on the hill-slopes presents the problem of multiple footings of various typologies coexisting on the crest or slope face, leading to a complex failure and interaction mechanism. It is essential to delineate the suitability of various typologies of shallow footing located on the slope crest and their influence on the overall slope stability and bearing capacity. 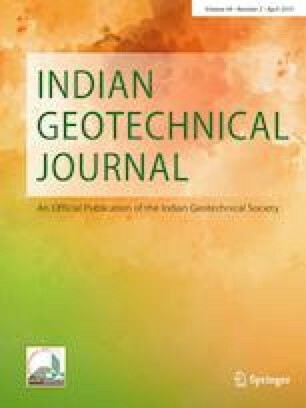 This paper highlights the interaction mechanism of such coexisting footings, as well as the applicability of interconnected footings on the hill-slopes to attain higher bearing capacity. The influence of multiple footings of identical or different typologies on the slope stability and ultimate bearing capacity was investigated. It is observed that interconnecting the isolated footings located near the slope face to those located away from the slope face provides a tieback mechanism and is beneficial in reducing the bearing stresses as well as increasing the resistance to the outward deformation of slope face. Based on the outcomes, it is recommended to adopt specific interconnected foundations on hill-slopes to ensure higher safety and sustainability.